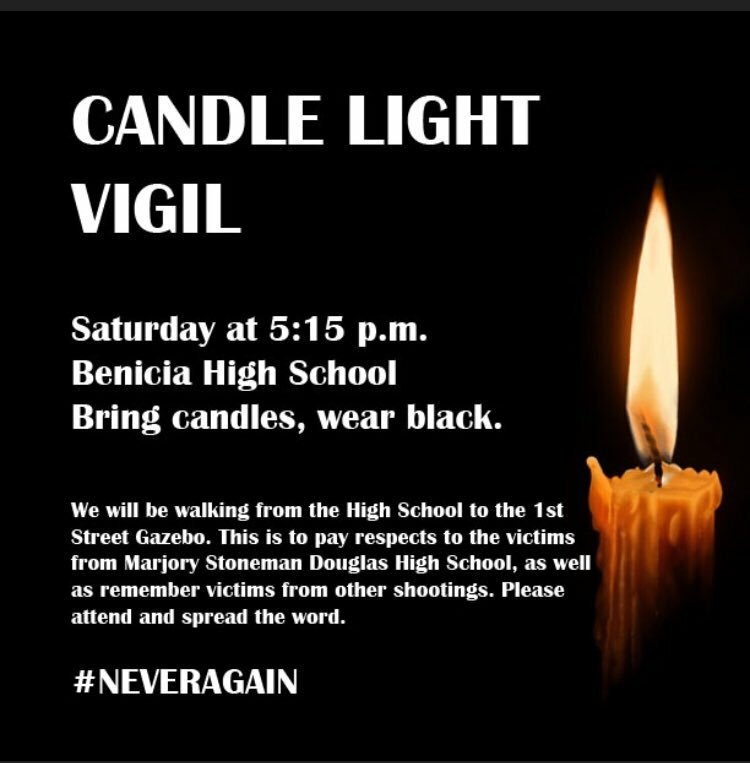 Benicia High students planned an evening vigil for Saturday, Feb. 24. Students gathered at Benicia High before dark and walked to City Park. At the Gazebo, they lit candles and honored those who were killed in Parkland. Planners included Carson Rendell, Enaiya Judkins, Grace French, Meghan Barrett , Chloe Bonini, Karah Fisher, Morgan Bundy, Valentina Quintana, and with media & footage, Chris Weldon & Anders Knutstad. We had a good turn out with 90% being students. We wore name tags of those who we lost and that are no longer with us. We’ve lost so many in events like Parkland that we ran out of name tags to write names. We walked from the high school to the gazebo holding signs saying “never again” and wore black. We read stories and such of those who were heros in the tragedy at Stoneman Douglas, we read about each of the victims’ lives and what their plans were, we lost many amazing students and staff in Parkland. All will be missed and were honored. We held candles and had a moment of silence in remembrance of those 17 lives and all lives lost in other mass shootings at schools. Benicia Students read statements they wrote about the change they would like to see in our country and the steps we as a country need to take. We came together and honored those that we lost and we will continue in the never again movement. From your Benicia Independent Editor: Never in Benicia, Never Again! It’s time for our elected leaders to take long overdue action to limit the senseless slaughter. See more on the BenIndy here. This page is dedicated to those who have suffered gun violence in the United States. Our guns are out of control. Senseless, that we cry out only after mass shootings. Below you will find most recent postings at top, followed by an archive going back several years. I will take a brief time out … again … from my reporting on crude by rail to raise the awful issue of gun control and the almost daily occurrence of mass shootings in the United States. (Mass shooting is defined as four or more people shot in an event, or related series of events, likely without a cooling off period). See below. IMPORTANT: The Guardian’s report, “994 mass shootings in 1,004 days: this is what America’s gun crisis looks like,” is a shocking visual representation of the almost daily mass shootings in the U.S. Your news media simply CAN’T KEEP UP with the flood of mass shootings. So far in 2015, (on October 7, the 280th day of the year) 379 have been killed in mass shootings, and 1094 have been shot and survived. Who knew, you might ask? Well, survivors, for sure. Their lives will never be the same. Nor will those of families, friends and neighbors of those who are killed or injured in these mass shootings. LOCAL: Note this story from last week about the gunshot slaying of a local family: 16-year-old Benicia boy suspect in his family slaying. SOME of the 59 guns police confiscated from a Benicia resident Thursday, including a 9mm UZI. A 28-year-old Benicia man who police said pointed a handgun at his roommate’s forehead Tuesday evening was arrested and charged with a felony.